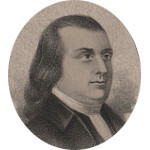 Abraham Clark was a New Jersey politician who is most famous for being a member of the Continental Congress and a signer of the Declaration of Independence. During the American Revolution, two of Clark's sons were captured by the British and incarcerated on the notorious prison ship HMS Jersey where hundreds of their fellow prisoners perished. The HMS Jersey was moored near New York Harbor during the war and earned the nickname of “Hell” for its inhumane treatment of the prisoners onboard. One ex-prisoner stated that they carried out up to 8 bodies a day to be buried in a common hole dug into the bank along the shore. Some of the dead laid among the living prisoners for up to 10 days before finally being removed and buried. Abraham Clark's family history currently does not have any links to famous kin. However it often only takes one additional ancestor added to a family tree to open a number of links to famous kin. So check back periodically to see if Abraham Clark's family tree has been updated.